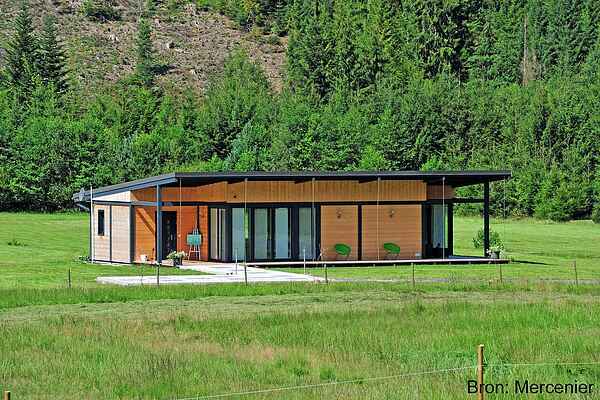 Modern, new vacation home (from 2011), in the deep forests of the department of Moselle. It's detached, surrounded by a meadow that offers plenty of space to kick a ball, play and enjoy the view of the densely vegetated mountains. The house is at ground level and made suitable for wheelchair users. The Sarre Blanche runs about 150 m behind your house. A little further in the valley there are a few more chalets on the road to the village of Turquestein-Blancrupt (6 km). Hiking shoes, binoculars and a backpack, you'll make unforgettable hikes straight from the house. For mountain bikers, this region is also a paradise. Bakery and basic groceries in St. Quirin. Large supermarket, swimming pool and golf course in Sarrebourg (19 km). On top of the Col du Donon (1009 m high, 16 km) you can enjoy the panoramic views of this beautiful green area. For a day of water fun, go to the recreational lake near St. Quirin (3 km) or the Lac de Pierre Percée (32 km), a large lake with beaches and canoes and pedal boats rentals. Get on the fun steam train in Abreschviller (10 km) and take a tourist trip by rail through the forest.